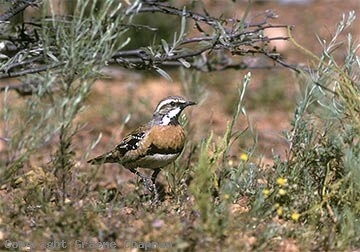 See under Western Quail-thrush for the form that occurs in Western Australia. 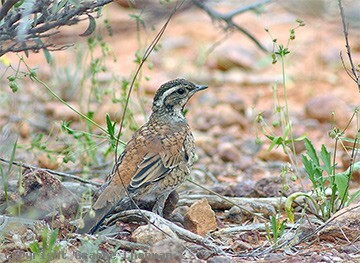 Chestnut-breasted Quail-thrushes are restricted to arid inland regions of NSW and Queensland, from near Winton in the north almost down to Cobar in NSW. Mainly found in mulga woodland, they also inhabit other acacia scrubs, usually those growing on rocky ranges and stony rises. Another important aspect of their preferred habitat is a well-developed shrub layer, and in particular, shrubs that are umbrella shaped, like certain eremophilas, which provide overhead protection from aerial predators, as well as cover for nesting sites. 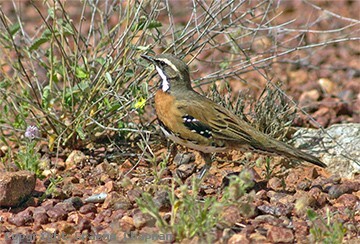 Normally when disturbed, the first thing a quail-thrush will do is run (or fly) for cover and hide behind, or under, a shrub. This is why they are so hard to see out in the bush - they see you before you see them. Look at image #438205 to see a bird caught out in the open by a hawk overhead - how to live longer, keep a low profile!! Chestnut-breasted Quail-thrushes have a rather chequered history. At various times they have been simply regarded as a subspecies of the more widespread Cinnamon Quail-thrush which is found in more open, shrubby country further inland. There are hybrid forms known from a very restricted area where their ranges overlap in the Beale Range near Cuddapan Station, west of Windorah in far western Qld. Not much is known about their life history but they do appear to occupy permanent territories - they can be found in exactly the same places year after year. 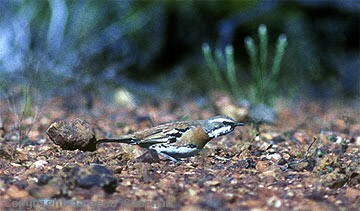 Like other quail-thrushes, they spend nearly all their time on the ground. The males sing at dawn, usually from the top of a shrub or other low perch, and their distinctive repeated piping call carries quite a long way. They do aim the song in different directions which has the effect of altering the perceived volume, making it difficult to judge just how far away they are. Reliable places to see them are at Bowra Station, near Cunnamulla, Kilcowera Station near Thargomindah, Idalia National Park near Blackall and about 15 km up the road to Louth from Cobar. 438202 ... Chestnut-breasted Quail-thrush, adult male. 438204-D ... Chestnut-breasted Quail-thrush, fledgling. 438205 ... Keeping a low profile - a raptor overhead.